I have to make a confession. After 20 years of living in Bend, I never really got into mountain biking until I left for college. And it’s a shame, because there were over 270 miles of continuously linked single-track mountain biking trails right in my backyard. So last year I officially tried mountain biking for the first time. I had an experienced friend take me out to Phil’s Trail, the popular biking hub that is less than 5 minutes away from PointsWest. From there, we had an overwhelming number of options of trails we could do. My friend graciously got me started on a beginner route called Ben’s trail, which has less hills and rocks than the more advanced trails do. After clumsily falling off of my commuter bike a week before, I wasn’t too confident about dodging rocks and roots and tree branches while going fast on a bike. We started out going pretty slowly when I came to my first obstacle where the trail wound in between two trees that were only about a foot apart. I closed my eyes, gritted my teeth, and somehow made it through the death trap. But instead of feeling nervous, I suddenly felt exhilarated. We were twisting and turning through tight trees, bombing down big hills, climbing up bigger ones, and ducking under overhanging tree branches, and I could not stop smiling. There were even smoothed out logs that you could bike over. I have always been into trail running, but this was so much more fun! The forest was our playground, and we had all day to explore. After over a year of mountain biking in my spare time, my efforts came full circle when that same friend took me out on Phil’s again. This time, we biked out to one of the classic Bend trails that I’d never dreamed I’d be able to do called “Whoops.” The name adequately describes the trail: a section of downhill that has lots of berms and turns and ups and downs and… “whoops.” Since it was a Saturday it was a tad crowded, but everyone up there was having a blast–and they were all very supportive because it was my first time. I was slower than the people who had done it before, but not by much, and again, I could not stop smiling. Throughout the year I have ridden in Bozeman, MT, and Oakridge, OR. 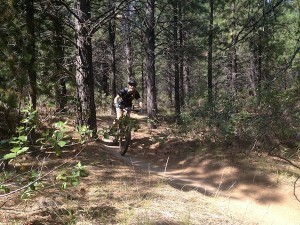 They were both fun, but it made me realize that Bend is truly the perfect place to fall in love with mountain biking. The trails are butter-smooth and mostly shaded so that you don’t get too hot. There are hills, but there are also flatter options. There are different levels of trails that you can take, so you never get bored. And if you’re going out with more experienced friends, every trail has more difficult side detours so that they have fun, too. 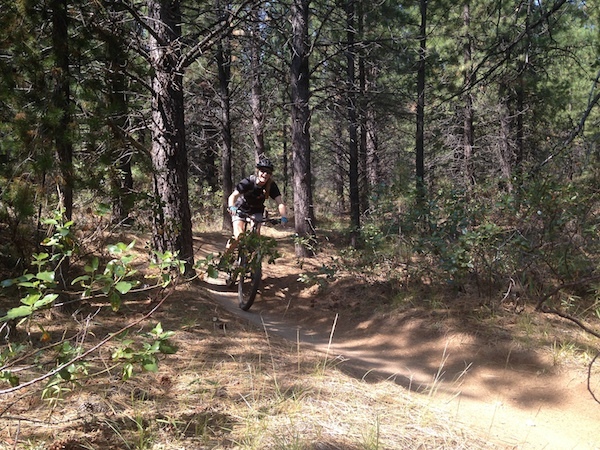 There are countless trails in Bend for beginners like me along with the world-class biking crowd. It’s easy to find a friend to show you some good places to start, but Cog Wild Bicycle Tours can also be a fun way to get to know the ropes. And believe me, it’s worth it. Now I know what this mountain biking craze in Central Oregon is all about!